"He has a good mind but......is going through a silly period right now". That just might be the best piece of feedback I've ever received, and I've gotten a lot of feedback in my lifetime. Those words were written on the back of my 8th grade English report card by Betty Jean Hyde, a teacher at Callanan Junior High in Des Moines, Iowa, in 1967. Back then, each teacher filled out a grade card for each student in his/her class, then each students cards were put in an envelope and sent home for a parent to sign and return. At the end of the school year, you were given all your grade cards from all your classes in an envelope to take home for your parents to review. I'm not sure if I gave my cards in 1967 to my parents to read or not, but I kept them. They had 8 children and things like this slipped through the cracks all the time, believe me. I stuck them away in a box of my personal stuff and toted them with me from town to town as I trudged the road of happy destiny for nearly 23 years. 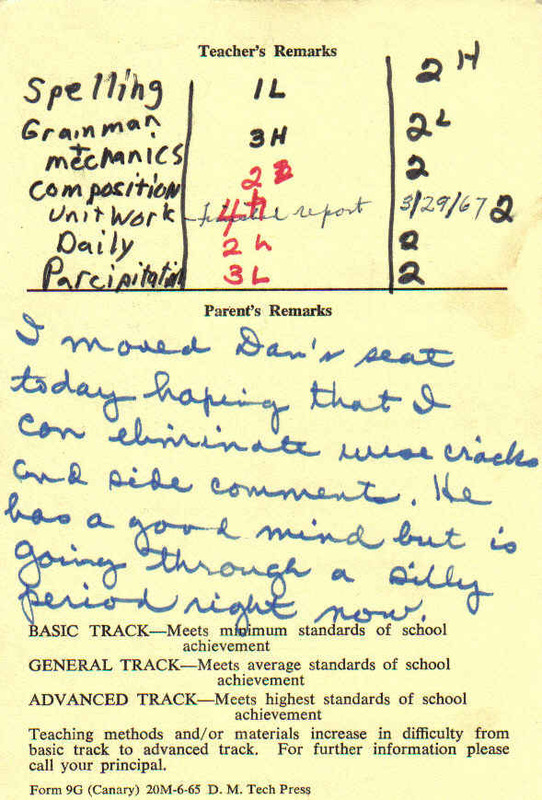 Sometime around 1990, this particular report card and this specific piece of feedback began to take on new and significant meaning. Before I tell you that part of the story, let's take a closer look at this report card﻿. 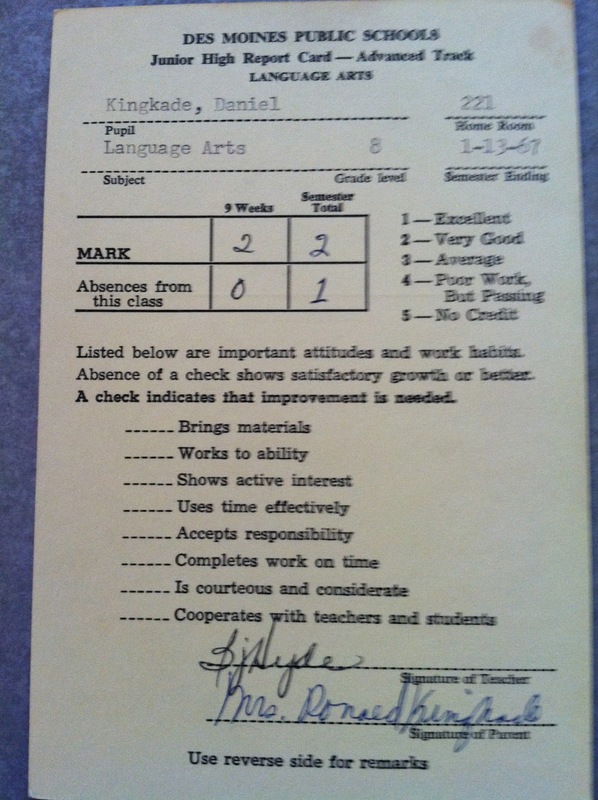 The front of the report card is signed by my mother who signed her name as "Mrs. Donald Kingkade". Back then, it was common for a married woman to sign her name using her husbands first name, rather than her own first name. I point this out not just because this is no longer a common custom, but because "Mrs. Donald" was soon to become an early adopter of the "women's lib" movement as it was referred to at that time. She would go on to reject Mother's Day and claimed that it was a vast conspiracy engineered by men to keep women in their place. Now to the back of the report card. Down on the bottom you will see BASIC TRACK, GENERAL TRACK, and ADVANCED TRACK with descriptions for each. Students were identified and grouped according to ability. If you were in the Advanced Track, you were one of the smart kids. If you were in the General Track, you were, well, just average. Imagine labeling kids as average today. Average seemed to be OK back then. That brings us to the Basic Track--you did not want to be in the Basic Track. Everyone knew who the "Basics" were and sadly I'm afraid, they knew who they were too. I started in the General Track when I was enrolled in the 7th grade after transferring from St. Augustine's Grade School. However, when school started in the fall of 1966, I found myself sitting in the Advanced Track English class along side the "smart kids". That class was taught by Betty Jean Hyde. At the top of the report card, in the teacher's comments section, Mrs Hyde has broken down the grade by sections of the English curriculum and you will notice that I was only doing average work. My 3rd quarter grades are on the left ranging from a 4 (equal to a D) in unit work to a 1 L (equal to an A-) in spelling. By the end of the year I had managed to earn 2's across the board. In other words, I got a B in Advanced Track 8th Grade English after spending a good deal of the semester getting my seat moved for excessive wisecracks and side comments. Clearly I was not working to my full potential. In spite of that, I continued in Advanced English all the way through high school, took a written exam before my freshman year at Drake and earned 6 hours of college credit for English before stepping foot on the campus in the fall of 1971. When the report card surfaced in the 1990's, the feedback Mrs. Hyde had written began to resonate in a very different way. "I had a good mind, but was going through a silly period." I liked that. It fit me. I had taken myself too seriously for too many years, I needed to lighten up. 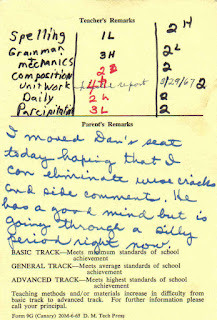 I started sharing the report card whenever and with whomever I could. I shared it as way to introduce myself in the seminars I taught. Stress Management Seminar- I shared it. Communication Skills Seminar- I shared it . Management Training- I shared it. I shared it in Iowa, Nebraska, in New York and in the Netherlands. I shared it to get a laugh. I shared it to connect with my students. Wherever I shared it, it worked. I'm still sharing it and it's still getting laughs. And the more I share it, the more I become aware of the gift that Betty Hyde gave me- a gift that goes far beyond the laughter that it created or the connections it helped me to make. Betty Jean Hyde was an exceptional teacher who had the ability to maintain a dignified and graceful presence, yet challenge her students to learn and grow. In spite of my immaturity at the time, I realized that she could look past my immediate behavior and see something more than my classroom antics. She had a way of giving you feedback without shaming you or embarrassing you. It would have been so easy for her to simply put me in my place, embarrass me in front of the class, but she never did. She made you want to learn and she taught you about respect and dignity. 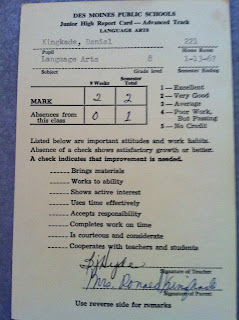 I began to talk about Betty Hyde when I shared the report card, after the laughs dwindled away, in a more serious tone. Who were your best teachers, I asked? What did they teach you? Whose influence do you still feel today? I talked about Betty Hyde for nearly 23 years. The only person I didn't tell about Betty Hyde's contribution to my development was Betty Hyde. But that was about to change. And that is a story that must be told. In the meantime, who was the one teacher that made the biggest contribution to your life? What did they teach you? Have you told them? I hated that song, I really hated that song. Let me explain why. 1. I loved music and thought it would rewarding and fun to teach music. 2. I had great teachers in my educational journey and they inspired me to want to be a great teacher. 3. Teachers were in demand and thus, job prospects and job security seemed good. 4. I really didn't want to be anything else. So imagine my consternation when I heard those lyrics on the radio (we still played the radio back then) or worse yet, caught some of my better students singing along to them on MY turntable in MY bandroom before school. Hey, teacher! Leave them kids alone!" Were they talking about me? Thought control? I don't understand. And if they didn't "need no education', why were they hanging around in the bandroom before school? 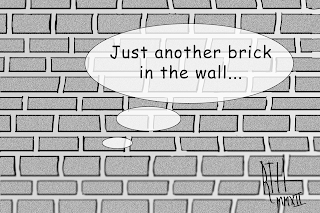 Let me put some context around this for those who are unfamiliar with the song, "Another Brick In the Wall" by Pink Floyd. I was aware of Pink Floyd, but not a fan or follower of their music. This song, and this part of the song, in particular, is an outcry against the British educational system. 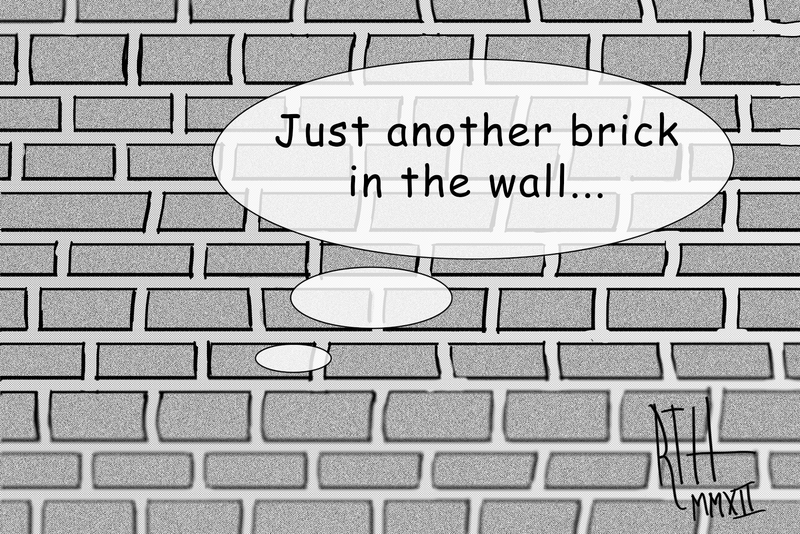 The concept album, "The Wall", where this song resides, is a highly acclaimed piece of modern rock music history. So what? My reality was that the students in my bandroom and the school I was teaching at in Parkersburg, Iowa ( pop.1650) were singing it and they thought it was cool. I didn't think it was cool. I told them they couldn't play that record in my room. They muttered under their breath. The moment passed. Which brings us to today and last year. Today, I don't hate that song, but I remember that song. I remember it for what it taught me about me. It challenged my concept of who I thought I was and why I did what I did as a teacher. It taught me not to take myself so seriously, for that moment at least. It taught me to remember that not every student I came across liked school as much as I did. It taught me to continue to strive to be as good as the teachers that inspired me. Which brings us to last year, 2012. 2012 was The Year of the Teacher for me. I had the opportunity through a series of planned and unplanned moments and events, to meet, recognize and honor some of the most influential and revered teachers from my lifetime. I will describe those events and moments in my upcoming posts, but let me say this about that- I am eternally grateful that those teachers didn't leave me alone. Rather, they left me for the better. I leave you today with the lyrics of a song from the musical "Wicked" that reflects a different expression than the Pink Floyd lyrics that began this post. "You do the Hokey-Pokey". " You put your right foot in, you put your left foot in...." You know the drill if you've ever been to a wedding that had a DJ doing the dance. And the song/dance lyric always ends with the group singing, "that's what it's all about!" What does that have to do with this blog, you might be thinking? Everything because part of doing the Hokey-Pokey is to "put your whole self in". This is after you've put your left foot, right foot, arm, leg and other appendages including one's back side. It's also everything because I used to DJ wedding dances for one of those mobile DJ services and, forgive me, made a whole bunch of people do the Hokey-Pokey. At the age of 60, I am going to attempt to put my whole self into writing this blog. There be will stories and experiences accumulated along the way. There will be observations and expressions from the the here and now. Some will be funny, some will be sad. All will be true. Some may be exaggerated a tad bit to make them more interesting. Names will be changed to protect the innocent. It will get personal, for me, at least. But if I do my part the best way I know how, it may get personal for you too. My hope is that I will strike a chord, resonate a nerve, jostle a funny bone, create a smirk. On my wife's book shelf, is a book called "Too Soon Old, Too Late Smart". I think I bought it for her, but I have not read it. The title of the book has floated around in my head since the day I first saw it in some store, probably in an airport bookstore as I hurried to catch yet another plane on the way to somewhere. Did I grow old too soon? Did I fail to learn along the way? I don't think so. That's my 2013 answer. Easier to say at 60 than at 30, or 40, or even 50. I am a storyteller by nature and by craft. I tell most of my stories when I am teaching, coaching and in everyday conversations. I know when I write my stories, reluctantly in part because I'm poor typist, I get more clear, more honest and more precise. Writing my stories helps me tell them in a more clear, honest and focused manner. Writing will also help me occupy and channel some creative energy that is not being fulfilled in my day job. I'm hoping that's the case, anyway. So I will write about what I learned along the way, what I experienced and what I am experiencing and learning today. Let me know if you are out there.